Dickens’ words from 1859 were so comprehensive that they could apply to almost any moment in history, but they ring especially true for equity investing over the past year- especially if you manage hedged strategies! According to Arbitrage Theory, an investor who implements a perfect hedge (taking no risk) would earn only the risk-free rate. It therefore follows that improving upon hedged returns occurs by reducing the cost of the hedge (both real and opportunistic) and/or increasing the value added by the hedge (in terms of reduced drawdown and volatility). For the first time since 2011, our dynamic hedge was triggered at the end of August 2015 and remained hedged through October 2015. The hedge was then triggered again at the end of December 2015 and remained hedged through March 2016. It’s abundantly clear from the data from both events that ALFIIX performed well (less than half Max DD, lower volatility, and similar total return) and ALPHACLN was challenged. Looking back on these events begs the question “why”? The answer lies in the fact that both the hedge and the long portfolios were moving in different directions, especially relative to benchmarks. Figure 2 illustrates the performance of the hedge component only for each of ALFIIX and ALPHACLN relative to their respective benchmarks. We can see that from a total return standpoint (negative numbers represent a COST to the strategies), the ALFIIX hedge was superior to the ALPHACLN hedge in both events. Yet it’s also clear that this COST was lower in the three-month 2016 event for both strategies than in the two-month 2015 event. This is inline with our expectations and research on hedge durations – the shorter the hedge duration the more it is likely to cost the investor. We should also point out that despite their cost, the benefits they provided occurred during the worst of the benchmark drawdown. When these “dark clouds” are hanging over markets, investors are most prone to making behavioral selling mistakes, and the dynamic hedge can help keep them invested. Looking back to the first tables again, note that in all events, the standard deviation was lower than the comparable market proxies. 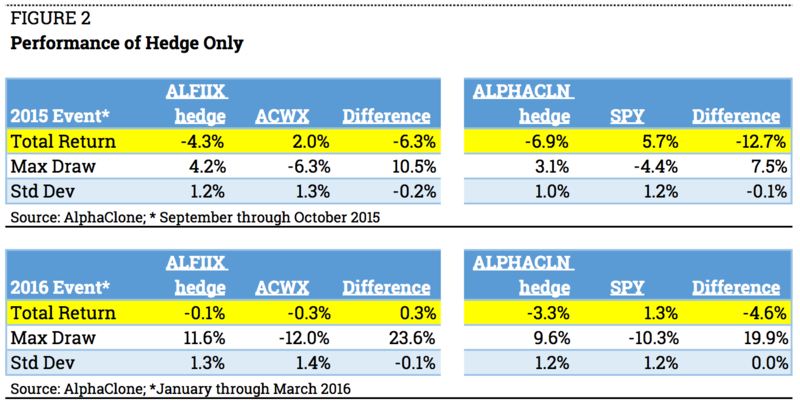 For ALFIIX, volatility was 56% lower; for ALPHACLN, volatility was 67% lower. Yet lower volatility is most helpful when returns remain above their benchmark. That occurred for ALFIIX during the first hedge event, and returns were not far off during the second hedge event. Markets in the past year have indeed reflected Dickens’ best times / worst times paradigm, with two shocks triggering the AlphaClone dynamic hedge. Performance was superior in ALFIIX, and the hedge costs were inline with expectations for both. Isolated events such as these provide good basis to test our assumptions for the DH, and confirm their cost-effectiveness for the tail-risk insulation they provide for substantially larger declines. [i] Specifically, history and highly successful investors (eg Paul Tudor Jones) have shown that markets trading below their 200 day simple-moving-averages are “riskier”. While this is an important technical level, substantial declines do not occur on every cross below. The vast majority of these crosses are followed by rallies which return markets above this level. Yet the longer markets remain below the 200d sma, the potential for downside risk rises.